This sunny city by the sea is home to a legion of battle-hardened agencies and freelancers, with the next generation coming through from both the university and the Arts University College – two educational establishments with stellar reputations in the industry. Alumni these seats of learning have gone on to make serious names for themselves in the business, and long may it continue we say. Bournemouth is one of those places that categorically proves, as if proof were actually needed, that truly world-class creative and development doesn’t always need to be originated in the planet’s capital cities. That’s lovely, but tell us about Meetdraw already! Alrighty then, let’s cut to the chase! 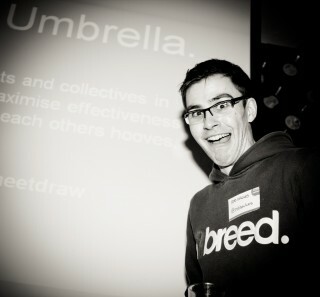 In the words of the organisers, Meetdraw is “a meeting of digital animals to talk about and share collective passions”. All told, we’d say that was a pretty handy summary of proceedings, and in real world terms, this has equated to some very heavy duty meeting indeed. As previously mentioned, this corner of Dorset has a sizeable community of digital specialists (employed, self-employed and students alike), and in turn, this means that Meetdraw events are BIG by the standards of most meetups today. So far, there have been ten such extravaganzas, and from what we’ve seen of them, attendee lists of 150 or so are not uncommon. See what we mean now? Another area where Meetdraw does things slightly differently is that the events themselves aren’t monthly, but more irregular in timing (usually every three months), and the venues are mixed up a fair bit; there might be a pool party (weather permitting), or one might find oneself in a smart hotel bar, replete with insane cocktail list (what was the name of those crazy brandy-based things at Meetdraw 9 again??? ), or somewhere altogether more Bohemian. Needless to say, Bournemouth is chock full of licensed establishments, and the organisers have always singled out some particularly choice examples in which to host the nights. As with the other meetups and social events we’ve already mentioned on this Blog, we’ve always been gratified to see that the student body is always welcome to participate; in fact learners are actively encouraged to attend, and Meetdraw does a sterling job of bringing everyone together in one place; the resulting buzz is intoxicating, electric; we just can’t get enough of it. The Heart & Sole posse have met some amazing people at Meetdraw over the past year, and massive shout-outs, inna pirate radio stylee, go out to (in no particular order, and there are bound to have been omissions): Bright Blue Day (which I didn’t realise was where one of my old muckers from teenage days, Giles Phelps, was on a creative direction contract), Sean Tracey, Jon Ginn, Tim Stone, Matt Crouch, James Hunt – in fact, there’s so bloody many of you, it would take us a day or two to list everyone, so if we’ve missed you out for some reason, apologies! Never ones to rest on their laurels, our industrious chums The Butchers, are expanding the scope of all things Meetdraw and will be hosting a conference in Bournemouth this September. Needless to say, we felt honour bound to give this something of a plug on these pages, and when we say conference, we’re talking about a full fat two-dayer bringing some of the finest minds in advertising and design to the south coast for what will undoubtedly be one incredible event. The focus will be on innovation and storytelling within the digital arena and judging by the rather impressive line-up, attendees will be sure to walk away chock full of new ideas, inspiration and having made a bunch of valuable industry contacts. We applaud the organisers’ commitment to creating events of this nature beyond the “traditional” confines of London or Brighton, and this is obviously something we hold dear to our own hearts. So, feeling tempted? Get the 28th and 29th September, 2011 in your diaries and head over to the Meetdraw Presents site for the latest information about the conference. Our long and fruitful association with the wonderful Rob Hawkes also stems from time spent at this event – in fact, the first time we met in the flesh was at Meetdraw 8 (the Christmas MeetBall 2010). Tom, Jo, Chris and I had arranged to pick Rob up from his place of residence and grab a bite to eat before heading over to the meetup. What he *didn’t* know at the time was that it had previously been decided he was to be subjected to a broadside of (good-natured) verbal abuse from the comfort of Tom’s car when we arrived (there’s a long and tortuous story behind this somewhere, and possibly one best saved for another day!). Thankfully, Rob subsequently forgave us for this rather bizarre “introduction”, and went on to give a fabulous talk on the sheer power of HTML 5 Canvas at our launch event, and will be back for more at Heart & Sole #2 with the ExplicitWeb team. Oh, and did we mention that he’s also managed to find the time to put together Rawkets, a paean to the arcade classic Asteroids, seriously reimagined for this generation, with a slab of WebSockets thrown in for good measure? Rob’s plan is to head deep into uncharted territory, where no developer has gone before, and explore new ways of pushing the boundaries of possibility. We salute this fine intention, and are sure that the journey will be a long and fascinating one. When we arrived at the venue for Meetdraw 9, bright-eyed, bushy-tailed and packed to the gunnels with all kinds of eastern delicacies (courtesy of the lovely Funki Sushi over the road), we were greeted by a very puzzling scene indeed. On entering the bar, we quickly realised that it was full of nothing but improbably tall, impossibly beautiful young ladies generally sashaying about the place in a very smart selection of cocktail dresses. Something was obviously afoot. The missing element was people of the male persuasion – there weren’t any in the joint! After a while, we thought we should probably make some polite conversation and get started with the evening’s serious business of a) catching up with our Dorset friends, b) talking a bit of shop here and there with new and interesting people and c) getting stuck into those crazy cocktails (the house special Hennessy Mash no less). However, there was a fundamental flaw with our plan; none of the Amazonian lovelies in the place seemed that bothered by frameworks of one kind or another, or the latest arguments about HTML 5 semantics. And then the penny dropped. What had actually happened was that we had stumbled upon a charity fashion show in the hotel’s *other* bar. With heavy hearts, we bid the girls farewell and headed next door, but any regret about changing locations was short-lived; it was Meetdraw night, and it was time to party! Alex is a Web designer, front-end developer and photographer, and along with Tom Kentell, one of the co-founders of Heart & Sole. Based in the city of Chichester, West Sussex, Alex lives and breathes digital design and marketing. Ahh fond memories of hurling profanities at Rob Hawkes :) Meetdraw rocks, gutted I missed the beach party. Meetdraw is where I’ve met most of my Tweet buddies – and made many new Twitter friends too! Well worth a visit, I am always amazed by the amount of people who attend, Bournemouth definitely has a lot of creativity there!